Indulge in a luxurious statement piece with the Ascot Oak Dining Chair Charcoal. Incredibly impressive, the Ascot Oak Dining Chair is an elegant addition to the home. Upholstered in fashionable charcoal fabric, the high backrest boasts quilted button detailing. Not only is the Ascot surprisingly versatile, a full webbed seat pad provides premium comfort when seated. 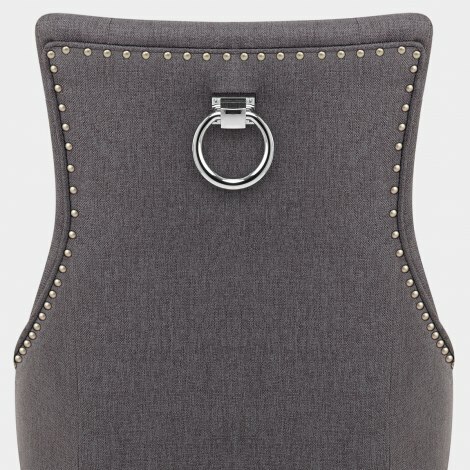 The rear of the seat is complete with a chic chrome ring whilst decorative chrome studs detail the edges. Set on a solid wooden frame with a polished oak finish for a classic look, the four legs make a strong and stable base. With protective feet plugs to preserve flooring, it’s a real versatile piece. "As an interior designer, I cannot fault Atlantic"
Very happy with my chairs. Very well made and good quality for the price paid. Recently bought 10 of these dining room chairs after reading the previous reviews and have to say that we are extremely pleased with our chairs they look fantastic and very well made. 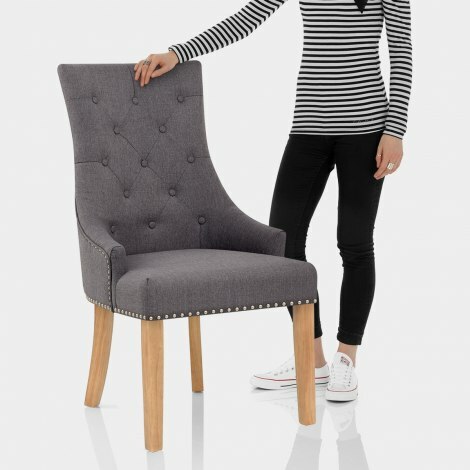 These chairs are beautiful the material looks very hard wearing and the button and stud detail is striking lovely charcoal colour. Very quick delivery would use Atlantic again, very pleased thank you. As an interior designer, I cannot fault Atlantic Shopping for their products. I have bought many items over the last few years both for my personal use and for my clients. The deliveries are quick, the products are good value for money, and the customer service is top class. The Ascot chair is a lovely accent or dining chair. It is bang on trend at the moment with the button detail and studwork. The woven fabric is again the current fashion and it appears well made, sturdy, and of good quality. There is a little self assembly but this is very easy for most people to do. The back knocker detail is again so very much the current "Mayfair Penthouse" style, the chrome is very heavy and good quality, and adds a very luxurious detail - perfect for a boudoir bedroom or glamourous hallway. Top marks, it is beautiful and I can't fault it.